A kettle, a shirt, some crayons - ordinary things which can make all the difference to someone who has been forced to flee their home and country. 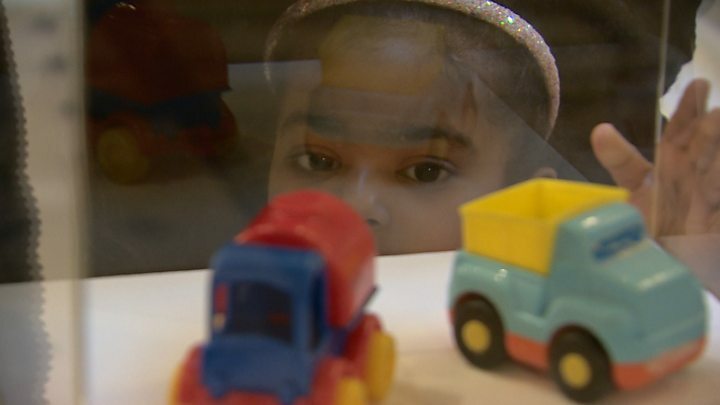 The award-winning exhibition, Museum Without A Home, is made up of items donated to refugees and it is in Scotland for the first time. To mark World Refugee Day, someone who knows first hand about relying on the hospitality of strangers has looked around the exhibition. "When I arrived here (in Scotland) I was really feeling desperate," explains Eiman, who is a refugee from Sudan. She arrived in this country with her young daughter last year. "I didn't have trust in myself, let alone anyone else," she says. "But in a very short time, I actually felt hopeful again." Part of that, she says, was due to small acts of kindness, be it a smile or something more practical, the kind of ordinary stuff that is on display here as the Museum Without A Home comes to Glasgow - much of it in Perspex cases. Some objects really speak to Eiman, like the nappies for instance, vital for someone with a young child, or a kettle, crucial when preparing milk. The exhibition items were mainly donated by people in Greece to refugees and asylum seekers as the refugee crisis began to unfold in 2015/2016. First shown in Athens, it was put together by Amnesty International and Oxfam. It has travelled the world, picking up items as it goes. Scotland's contribution is welcome letters written by locals. "Behind each one of these simple items is a story," says Lisa Stewart of Oxfam Scotland. "If you have nothing and you arrive in a new place, the simplest act of kindness can make a really big difference, whether that's in Athens or here in Glasgow. "So with these items, it's the story that they tell, even if they seem like a strange thing to put in a display case." One of these strange items is a jar of moisturiser, resplendent in its own display case. For Eiman someone sharing an item like that she thinks would make you feel "human" and "dignified". Looking round the exhibit has made her reflect on her own experiences and what makes somewhere home. "Home is only made of simple things, you put together many simple things and then you have a home." The pop-up Museum Without A Home exhibition is on at Glasgow City Chambers until Friday.